This dramatic piece of art is inspired by a flotilla of Ridley sea turtles coming together to nest. 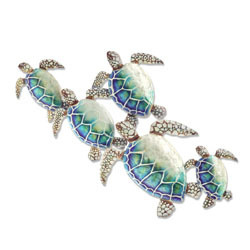 They are swimming towards the beach through the shallow waters represented by the strong aqua based colors. You can almost see the sunlight reflecting off their right side where the color is stark white. The artist recreates the organic body structure of sea turtles by using capiz shell to create the spotted characteristics covering their limbs and head.